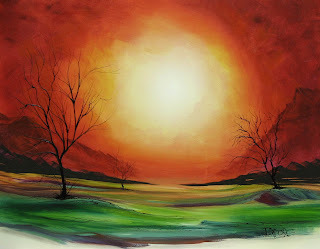 A new acrylic painting was released today and is available at several online galleries and offered by Dapore's own web site http://www.originalabstractart.net The piece is a large 24x30 inch original acrylic painting and uses a bold color pallet. A tunnel effect in the sky draws the viewer into the piece. A green valued foreground compliments the orange in the sky. Though a bold array of coloration was used the painting produces a quiet mellow mood. PAINTING INFO:. Hand painted original acrylic art. Add this painting to your home or office and you will find the stylish and unique decor that you have always been searching for. FINISH: Liquitex UV mat varnish. PACKING: To guarantee you receive your order in good condition we custom build Styrofoam shipping cartons per order. 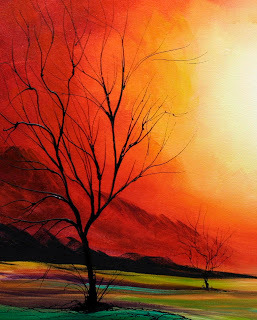 LANDSCAPE 297; is a original acrylic painting by Theo Dapore. This piece is brighter than the photo shows. Glowing lighting effect. Large painting with 3D impasto trees. The painting is gallery wrapped with sides painted so the painting may be hung without adding the addition of a decorative frame. Hanging hardware has been installed so the piece is ready to hang. Finishing is done using a mat ultraviolet varnish. 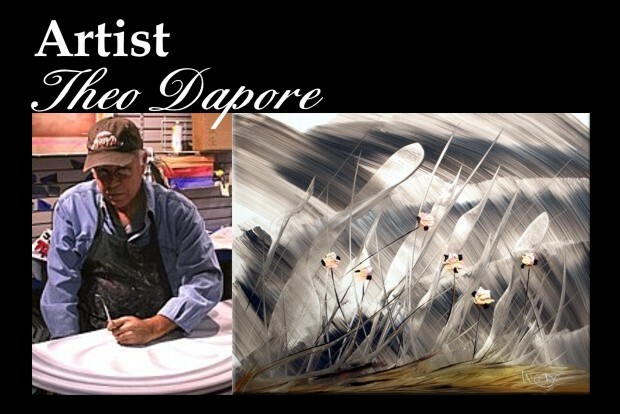 Dapore is a well established and collected artist. He is listed in the national art registry and all of his works are documented and electronically filed. Theo's studio, located in Wiregrass Mall in Dothan Alabama USA, is prompt to answer e-mails. Shipping: all art will be shipped in styrofoam cartons. The cartons are hand made to fit the individual clients order. To date over 1200 packages have been shipped worldwide, using this method with not one damaged. The studio ships USPS priority mail and includes insurance for the full amount of purchase. Delivery confirmation is also supplied.